Dimensions: 13 1/2" x 8 1/4" x 7 1/4"
I now own 2 pair of the HD5's The first pair I accidentally blew both pair, I was really hurt over that so instead of trying to replace woofers and tweeters I purchase a second pair, I still own the blown pair but I will put them on Ebay for whatever reason as parts...I love these speakers because they sound very nice, I've always been impressed with the Boston HD5's....I use these speakers in my pro studio as reference only, if my mix sound good on the HD5's my music get the stamp of approval with these inexpensive consumer level speakers! 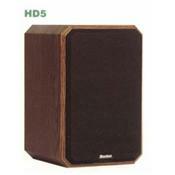 There is that variation of low quality but this is expected from an entry level quality speaker, with low volume music these speakers shine as when I first listen to a pair I was impressed! I've owned a pair for more than 10 years and they still sound excellent. Paid $100 USD at Magnolia Hi-Fi in Beaverton, Oregon. My brother owns two pair of these...one set for his office and one set for home. Currently I use mine to mix down in my home studio. Love 'em....never sell them. They are not audiophile quality but they're much better than so much crap out there today and the price was right. I should mention, I've run these A/B against nicer JBLs, B/As, and Infinity speakers and there is little audible difference. I agree with the positive rating for sound quality. The bass that comes from these teeny speakers is pretty good. Except if you turn it up even a little they fry. At least that's what happened to me. All of my equipment was totally within the specs, and the volume wasn't that loud. One woofer fizzled. So the good price doesn't seem like a value when repair/replacement is considered. Picked this up at Goodwill a few years ago; great little speaker for under $100. Absolutely amazing bass and good highs/mids. I'm not sure where its weak exactly as far as frequency but it will get fatiging after hours of play at high levels. I must reiterate that for the money/diminuative size, they can supply the sound for parties and pull it off brilliantly. Truely a David(as in David and Goliath) but there is really no imaging whatsoever. Jazz sounds excellent, bass response is shockingly good(for its size), a great little speaker for the bedroom, shop, office, or rear usage in HT. Now I want to check out the rest of the Boston line.